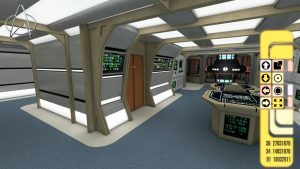 The heart of a starship is the warp core which is the responsibility of the Engineering Department. There are many jobs which need to be done in this department. Chief Engineer / Chief Technical Officer, Lead Propulsion Engineer, Lead Life Support Engineer, Lead Electrical Engineer, Lead IT Engineer, Lead Combat Systems Engineer, Lead Equipment & Vehicle Engineer, Engineering Admin Assistant and Engineering Crewman. More information on these positions is available on the job description page. Engineering: While maintenance does not sound like the most glorious of jobs, it is nonetheless of utmost importance on any starships. The Engineer Department is responsible to keep all systems running smoothly, providing repairs and upgrades when needed. When it comes to a survival situation, the Chief Engineer has as much as say as the General-On-Board, if not more. The Chief Engineer (CE) or Chief Technical Officer (CTO) oversees the Engineering Department. He/she is responsible for all operations and maintenance that have to do with all systems, machinery and equipment throughout the ship. The Chief Engineer is fourth-in-command and assumes command of the whole ship in the absence or incapacitation of the Captain, the Chief Officer and the General-On-Board. On ships without a Military Department, the Chief Engineer is third-in-command. Responsible for the maintenance of the ship’s life support systems including oxygen generation, air circulation, water circulation, heating & waste control. Responsible for the maintenance and distribution of the power network within the ship including main & sub power generators, solar panels, backup power systems and any other alternative power sources. Responsible for the maintenance of all computer systems on board, including server mainframe, user hardware, software and AI systems. Responsible for the maintenance of on board combat’s systems including offensive systems such as artillery batteries, laser canons, gun turrets, missiles as well as defensive system such as shield and cloak.